For many, buying a house is the American dream, but these days, snagging a suitable home has turned into an all-out war in some places, with victory often going to the highest bidder. Experts say housing prices have been steadily increasing and are likely to continue to rise. All the while, interest rates have remained low and new home construction has been lagging, creating a limited supply of available homes. This combination has stirred up a nightmare scenario for many homebuyers and a dream come true for sellers. "It's a tough market to be buying in," said New York real estate guru Barbara Corcoran. "Every buyer's uncomfortable. If you're an aggressive buyer, it's the kind of market that brings the fangs out. If you're an insecure buyer, it's the kind of market that's going to scare the crap out of you." "Nightline Prime" followed a few couples who were fighting for their dream home, only to be outbid many times over. But real estate experts say there are some things buyers can do to give themselves a competitive edge, such as including a short letter about yourself in your offer application to the seller. 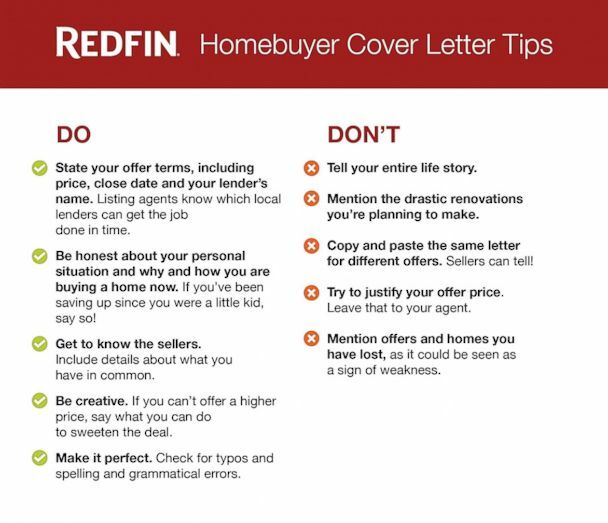 Real estate agents from Redfin, a national real estate brokerage, put together a "do's" and "don'ts" list of what potential homebuyers should write in a cover letter when putting an offer on a home.